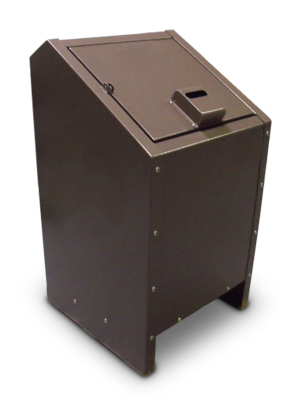 These animal proof steel litter receptacles are perfect for parks, campgrounds, walking trails, and dog parks. 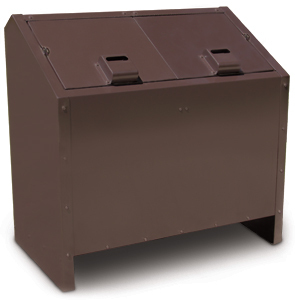 The tamper proof lids and heavy-duty steel prevent animals from getting into the receptacle, keeping the area clean and safe. Rear door opens laterally and can be locked. Rust resistant pre-galvanized steel sheet metal (12 Ga. Panels, 14 Ga. Doors). Stainless Steel hinges & handles. Bear resistant latches on lids, doors, & handles. Self-closing & weather proof lids. Single Unit holds one 35" x 50" garbage bag. Double Unit holds two 35" x 50" garbage bags. Internal slide-out liner support rack. The state of the art finishing process used on the receptacle combines the application of an 'Electrocoat Zinc Rich Primer' with a durable polyester powder-coat top layer to ensure every crevice and joint is completely sealed, providing full protection against	corrosion and weathering. Receptacles are finished in either a gloss or textured polyester powder-coat finish.